I’ve seen this quote again and again posted in my favorite social media sites and it gives me pause each time I see it. Instantly I think of grandiose actions: paying off someone’s Christmas gift layaway at Walmart, giving a struggling family one month’s rent, hosting a huge Thanksgiving dinner for military personnel who can’t be with their families during the holidays. Oh, how I would love to do these things! 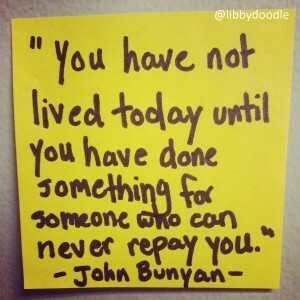 To be able to bless someone in such a way that they can never repay you… wow. That could be considered the ultimate random act of kindness. Winter is now upon us, the cold snap biting through layers of warm clothes wrapped around my body. I am not a fan of winter. If I had my way, I would stay in my warm home from Thanksgiving to Easter, only peeking out my head like a groundhog to see if spring was indeed six weeks away. The mere mention of winter weather makes me shiver with goosebumps on my arms. I absolutely hate being cold! 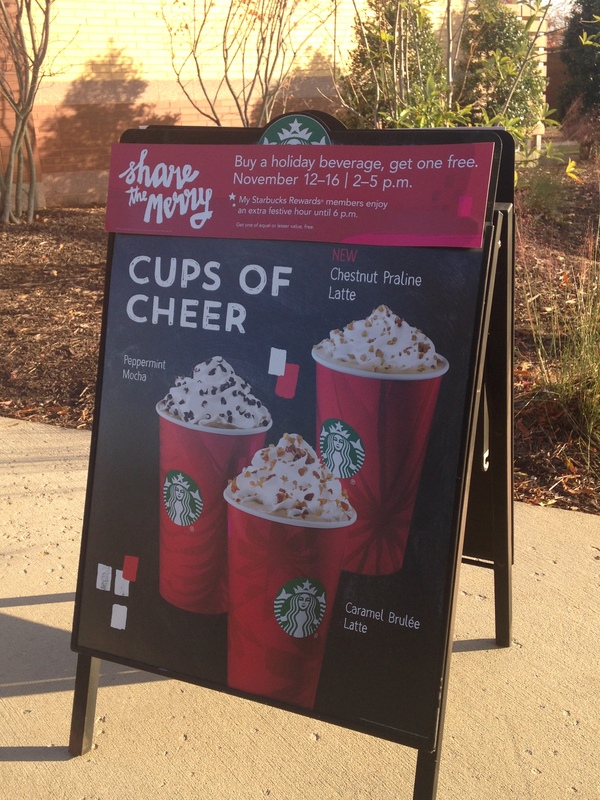 So you can imagine my delight in discovering Starbuck’s “Buy One, Get One Free” promotion on steaming hot holiday drinks a few weeks ago. Two for the price of one AND I can stay warm while blessing someone else, too! Awesome! My RAKs are simple RAKs. I’ve never had the financial means to do the extraordinary RAKs like others, so I do little things here and there in my own way to brighten someone else’s day. When I see something I can get for free, my first instinct is to grab it, then give it away. Sharing is fun! On this particular cold afternoon, I decided to bless a stranger on the street with a caramel brulee latte. I could only imagine how cold it must be to stand outside, hours at a time, waiting and hoping for meager donations kind people may give. Now I know there are many out there who would like to debate the issue of panhandling, and I will admit that there are times when I really just want to drive from one location to the next without a reminder of those more unfortunate than me. But this day was different. I drove for a bit heading towards the city, surprised at the lack of people asking for help on the street. I could see tree limbs bending in the wind, fall leaves rustling across the ground. It really was a cold day. 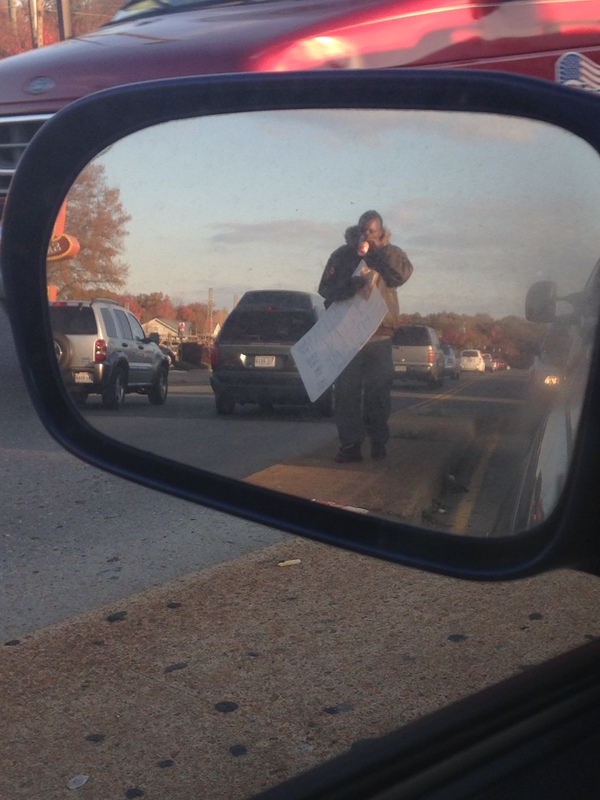 Maybe even too cold for the panhandlers. Then I saw him. Like others I’ve seen in the past, he held a sign in his hand. “HOMELESS PLEASE HELP ME” written in large block letters. I could even see words he had written on the side. “Drug Free. Alcohol Free.” I guess it was his way of reassuring any generous souls that he wouldn’t abuse donations given. As I pulled a little closer in the traffic by the stoplight, I took notice of details. His sign looked new, still white as snow. He wore a heavy coat, zipped up the front. He looked pretty well dressed for a homeless person and his face seemed free of dirt and grime. As he turned to the side, I could even see he was wearing name brand jeans. It was in that moment I did something that I swore I would never do. In the millisecond it took for me to process all this information as my car inched through the turning lane, I kept driving. I didn’t make eye contact. I decided to look for someone else who needed more help than him. I pulled into the turning lane and once again waited at the stoplight. I caught his eye and motioned for him to come towards my car. I opened my window and held out the still steaming cup of coffee along with a Starbucks bag filled with napkins. I smiled as he approached my car. “Hi there. It’s really cold out here and I thought you might like something warm today. Be blessed!” His hardened face broke into the sweetest smile and I knew in that moment I was forgiven for my previous judgment. “Thank you. Thank you so much,” he replied. As he reached for the coffee, his bony fingers brushed mine and they were ice cold. Stiff. Frozen by the chill of the day. And then I saw his coat. The huge winter coat with the fuzzy hood that looked so warm and cozy from a distance was actually quite worn, with tattered edges on the bottom. The color was faded by weather and life, the side ripped from armpit to waist. Stuffing the color of gravel billowed from the rip. This coat, and this man, had seen better days I’m sure. He took the coffee and napkins, walked past my car, then turned around to take a sip of the warm drink. I snapped a quick photo from my side mirror then drove home in humbled silence. A cup of coffee. Such a small thing, really. Didn’t cost me a dime. 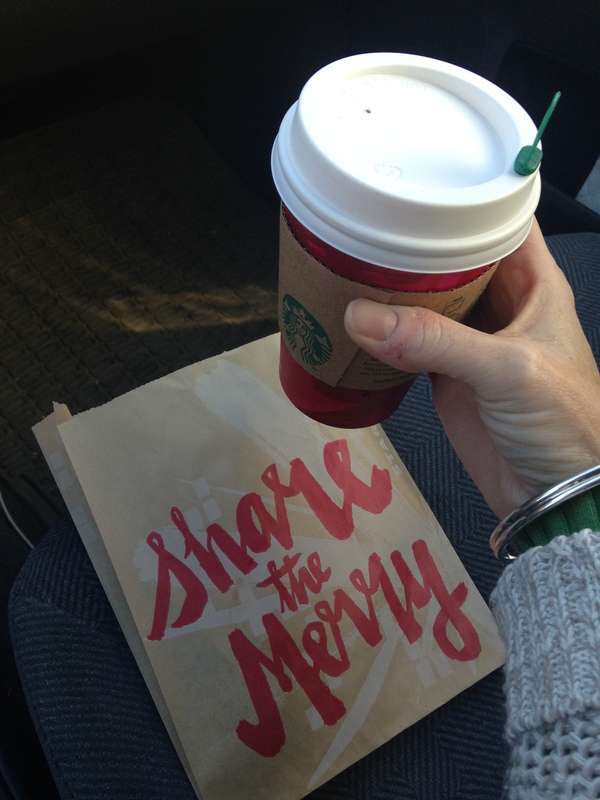 (I used a gift card to purchase my drink – thanks Kristy for your RAK to me!) Here I had set out to bless a stranger and ended up being the one blessed in return with a reminder not to judge those around me. I don’t know his story. I didn’t even ask his name. But he was the one God wanted to bless; I was merely the messenger. While I’m sure this doesn’t qualify as a grand act of generosity, it still felt great to give to a stranger who could never repay me. Since he can’t pay me back, maybe he can pay me forward, by sharing kindness with someone else. It only takes one to start a domino effect. Be the domino. You are destined for greatness. Go and do good in this world!